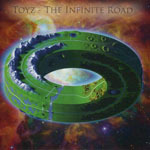 Share the post "TOYZ – The Infinite Road"
Every so often a disc shows up that looks just the same as a million others – classic prog-rock cover, picture of the band looking completely normal, track-list titles that would sit on any other album; ‘Departure’, ‘Face The Mirror’, ‘Far Away’, etc. Then you sit down to listen and it just blows you away. Trust me, this blew me away. Toyz are a Dutch instrumental progressive rock band (ring any bells?) and ‘The Infinite Road’ is their self-released sophomore effort. Try, if you can, to imagine Focus (minus the yodeling) with Joe Satriani and Jeff Beck joining Akkerman on guitar duties and you start to grasp what’s on offer here. Instrumental albums per se tend to get a bit samey as they progress but such is the quality of the writing and instrumentation here that interest never flags for a minute. The album is chock-full of anthemic riffs, soaring keys and absolutely stunning guitar work from Peter van Heijningen that propels the music to a very special place. The best example of this (although there are ‘best examples’ all over this album) is the second track ‘Face The Mirror’ where the guitar not only works as the ‘singer’ but also gives notice of the magnificence to come. Other highlights include the Jeff Beck inspired ‘Tears Of Joy’, the Satriani slash and burn of ‘Dream On’ and the distinctly Floydian ‘Thermal Winds’ – although, to be honest, the selection of ‘highlights’ is entirely fatuous with an album this good. It’s a shame that GRTR reviewers had to list their ‘Best Of 2012′ before this gem showed up as it would certainly have been up there. In short, ‘The Infinite Road’ is not just a prog-head’s dream but a definite must-have for all fans of classic guitar rock exceptionally played. This entry was posted in ALBUM REVIEWS, ALBUM REVIEWS (Mobile), All Posts and tagged album, Dutch, Holland, instrumental, prog, progressive, rock, The Infinite Road, Toyz. Bookmark the permalink.